As a building or construction material, we all know that PVC has been used for years. It is a popular material for pipe lines, sewer lines, and other types of plumbing, and is known for being one of the sturdiest and most durable materials around. But have you ever heard of uPVC doors? If you have but you do not know enough about it, below is an outline of everything you need to know about uPVC doors – and why they have become an even more popular choice today. What is uPVC, and what are its uses? uPVC is an acronym for Unplasticised Polyvinyl Chloride. Another term for uPVC is “rigid” PVC, because it is harder than ordinary PVC (and not as soft or flexible). But the main difference between uPVC and ordinary PVC is that uPVC does not contain any BPA or phthalates, which are chemical plasticisers that are used to make plastics softer, and which have been known to be unsafe for humans. As a matter of fact, uPVC is also used for making mouthguards and dental retainers, which only proves how safe, stable, and durable it is as a material. Apart from being used as a door material and as a material for dental retainers, uPVC has other purposes as well. uPVC is also a well-known material for other home or building elements such as window sills and frames, fascia (the band or facing which runs horizontally under the edge of a roof), cladding, and, of course, plumbing (as pipe work, gutters, and downpipes, among others). But why is uPVC becoming increasingly popular as a door material? First of all, uPVC is low maintenance. In fact, it is one of the lowest maintenance materials you could find today. A uPVC door is easy to clean and maintain and only requires a good wiping with a clean cloth and soap and warm water every month. But what makes a uPVC door stand out as a worthy investment is the fact that it does not warp, rot, flake, crack, twist, or rust, unlike wood or steel doors. 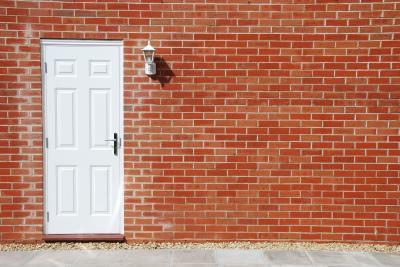 Even the most extreme weather or temperature will hardly leave any effect on a door made from uPVC. And since uPVC doors do not have any discolouration and do not fade, they do not need to be repainted every few years, either. Additionally, if, by any chance, your uPVC door gets a scratch, this can be easily wiped or polished out. In addition to being low maintenance, uPVC is completely recyclable. This makes it one of the more environmentally-friendly materials around. Aside from being environmentally friendly, uPVC doors are also durable, lightweight, energy and thermally efficient, and easy to create, work with, and install. But if you think that a uPVC door will undoubtedly be unattractive, think again. As a matter of fact, uPVC doors today come in a wide variety of styles, designs, and finishes. At door and window specialists like www.windowstoreplastics.co.uk, you can choose from a broad selection of uPVC doors in different styles (such as solid or panel doors), different hardware options, and different colours, including wood grain finishes that give it a more attractive, traditional appearance.